I have always been a sucker for Antibacterial products. I thought that they were good for me to use because they kill germs that make people sick. What I didn't realize is that they rob your skin of the germs and bacteria that we actually need in order to stay healthy. Thats when I went on the hunt for a better hand soap. Let me introduce you to Cleanwell. 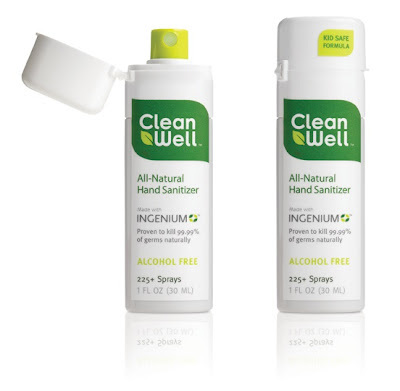 CleanWell products kill germs without the use of toxic or artificial chemicals, and unlike most other anti-bacterial soaps, CleanWell does not contain alcohol or Triclosan, which has been linked to a number of health concerns. Additionally, they’re free of artificial colors, artificial fragrances and parabens and are readily biodegradable and certified cruelty-free. I tried the Orange Vanilla Hand soap and let me tell you that it smells so good that I was tempted to taste it! I love using it. It comes out in a foam that is nice and convenient and not-so-messy! Cleanwell also sent me some hand sanitizer to use. I am a hand sanitizing junkie. I have a bottle in my car, purse, diaper bag and coat pocket. I am never without it. You can buy Cleanwell products at Target, Amazon.com, Bath and Body Works and Whole Foods! Yeah! Thanks to the kind people at Cleanwell, you too can try the Orange Vanilla Hand Soap and Hand Sanitizer. All you have to do is head over to Cleanwell and find your favorite product (other than the two that I have mentioned). Come back here and let me know which product you love. YOU MUST include your email address in order to qualify. Earn an extra entry by becoming a NEW Twitter or Blogger Follower (you get it, new, not old...) This awesome contest ends on May 10th at NOON EST. Good Luck! Ok, well I HAVE to mention the hand sanitizer. I got it when we first had Isla (honestly!) and made everyone use it. People were seriously impressed every time I pulled it out because it wasn't the Germ-X/alcohol filled/awful smelling stuff they wer expecting! I actually have a purse sized spray of the hand sanitizer but it's sort of an herbal scent that Roo doesn't like much. I didn't know it came in orange vanilla- I bet she'd love that! I like the spearmint lime hand sanitizer. I would love to try the pocket wipes! Thanks! I would like to try the individual hand sanitizer wipes to put in my daughter's lunchbox every day!! Thanks for the generous giveaway! I think the sanitizer wipes would be great! I would love to try this-especially the starter pack in lavender absolute! just signed up to follow you on Twitter this evening! My favorite is the Mother's Day Gift Pack. Thanks for the giveaway! I'd love to try the Orange Vanilla hand soap. The spearmint lime hand soap sounds great. I also like the idea of the hand sanitzing wipes..nice. I like the Individual Hand Sanitizer Wipes Pack. I like the lavender in hand wash or sanitizer. Thanks. spearmint like handsoap sounds lovely! I would like to try the Starter Pack Lavender Absolute and Orange Vanilla hand soap. I'm a new follower. I just followed you just now. I'm a new Twitter follower. The sanitizing wipes and Mama's gift set...although the ones I really want most, no lie, would be the hand sanitizer and orange vanilla hand wash, lol. How did you find so many great companies to take part in your giveaways? i'd love to try the ginger bergamot hand soap! I'd like to try the ginger bergamot hand soap. I love the sound of the Lavender Absolute hand soap. That sounds divine and safe to boot. Love the Individual Hand Sanitizer Wipes Pack! The Spearmint lime hand sanitizer sounds amazing. What great fragrance choices! I like the Pocket Wipe Packs. I love the pocket packs also, but since it was the previous comment I also love the lavender absolute hand soap! I found this site very helpful because regular hand sanitizers dry my hands so much. The starter pack would be wonderful. I also love the colors and scents this comes in. I've been looking for something different, toddler put everything in their mouth covered in bleach or not ..not good! I like the wipes and the spray makes life easier! Lavender is one of my all time favorite scents! The Ginger Bergamot foaming hand wash sounds wonderful, I love both scents!